This cake is my new favorite Christmas cake. It isn’t too sweet, has lots of gingerbready, spicy oomph and, topped with a snow shower of confectioners’ sugar, it’s a pretty sight. It’s beginning to smell a lot like Christmas in my kitchen. We are eleventh-hourers! It’s not only because we have perfected the art of procrastination. Without a little one or even a middle one around in the past few years, I have started the month of December with the thought of oh, let’s just skip it. But the now grown-up little guy is newly wed, and the happy couple will be here in a few days…. so yesterday, we braved a torrential rainstorm to buy one of the three remaining trees on the lot. With cakes in the oven, and lights on the tree, I don’t care that I’m late to the party. I’m just groping for the lightness we are all craving right now, in a year that is ending on a low and dark note. So if sparkling white lights on the tree and glasses of sparkling white Burgundy help lighten my heart, then so be it. Here’s to a happy holiday, dear friends! Hold your loved ones close, count your blessings and have joy in your heart as we ring in a new year. Cling to hope, because hope is good, and we can and will cross into happier times. About this cake: My friend, Jill O’Connor, author of Cake, I Love You (Chronicle Books, 2017) has so many scrumptious cakes in her book it was hard to choose one. She calls it ‘My Pretend Irish Grandma’s Whiskey Gingerbread’. because in truth, her grandmother would rather be doing just about anything but baking this cake. My own Nana would probably not have made the cake either, but I am quite convinced she would have relished it with a glass of Irish whiskey on Christmas Eve. Unlike many cake batters, this batter is quite soupy; so don’t be alarmed. You can pour it into the pan. It results in a lovely, light texture without a hint of dryness. I have started using vegetable shortening to grease Bundt cake pans. The shortening has none of the water or milky residue of butter, which sometimes causes cakes to stick to the pan. Because it does not need to be ‘greased and floured’ in the usual manner, no unsightly flour clings to the top of the cake when you turn it out. Tip: Treat your cake like a steak! An instant read thermometer inserted into the center of the cake should register 205º-210ºF for the best result. I am a total geek when it comes to thermometers, and yes, I use one to test the center of a cake as well as steak. I’ll never go back to toothpicks. 1. Set oven at 350 degrees. 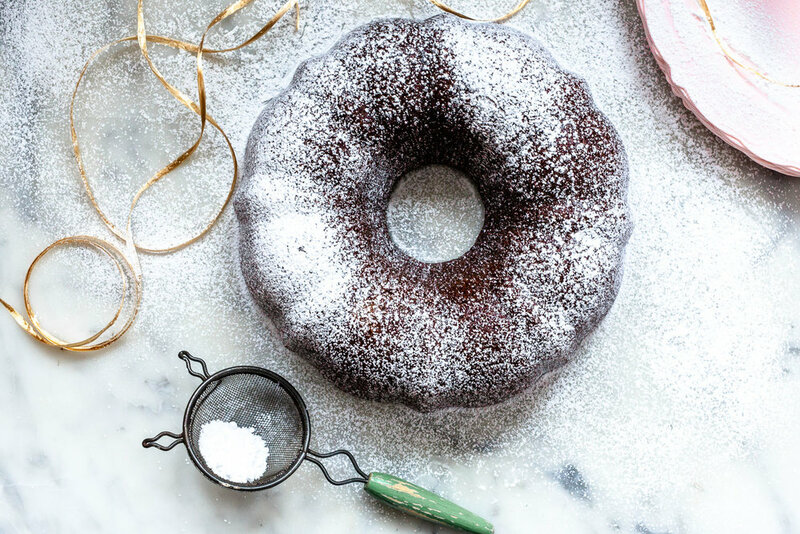 Coat a 10-inch Bundt pan with vegetable shortening or melted coconut oil. In a bowl, beat the eggs and buttermilk with a fork, and set aside. 2. In a large bowl, whisk the flour, baking powder, salt, nutmeg, ginger, allspice and cloves until blended. 3. In a large saucepan, combine the butter, molasses, brown sugar, white sugar, coffee, whiskey and grated ginger. Stir over medium heat until the butter melts and the mixture is hot. 4. Remove the pan from the heat and add the baking soda, stirring until the bubbles subside. Gradually whisk in the egg mixture. 5. Make a well in the center of the dry ingredients and pour in the molasses mixture. Whisk until the batter is smooth. 7. Cool for 10 minutes and unmold onto a cooling rack. When cool, sprinkle with confectioner’s sugar. ©2009-2018 Sally Pasley Vargas. Writing and photography, all rights reserved.